Did you think you saw the last of the King and Queen of Daxam last episode, when Mon-El told them to go home to their questionably-destroyed planet and leave him on Earth with Kara? Because I sure did! And I was wrong! Miserably, miserably wrong. Note: the fact that Mon-El grew up to be reasonably well-adjusted and willing to change (while, granted, still lacking in altruism) with sai-wielding Queen Eeeeevil as a mother is actually remarkable. Credit to you, Mon-El. Clearly, your more reasonable father’s nature overpowered your mother’s poisonous nurture and turned you into the almost-good person you are today. All right, first issue: the Daxam king and queen have yet to return to the planet I’m still not really sure exists anymore or not because no one has been very clear on that matter. They’re just hovering around Earth, and I would think that’d be a serious political issue — especially for the countries around the globe that have no idea who Mon-El is, what a Daxam is, or why the United States is just letting a great big spaceship chill up in orbit for days — but nah. It’s all cool. I mean, President Wonder Woman is rather concerned, but it’s really no big deal. Well, other than the fact that Queen Daxam (okay, fine, her name is Rhea — but I’m not bothering with King Hercules’s real name, since he’s gonna die) has put a hit out on Kara. A really, really expensive hit that rewards enough space currency to buy a whole planet, by the way. How does the queen of a destroyed or almost-destroyed planet afford such a reward? Not really sure. Frankly, the whole Daxam continuity is full of enough holes to make a coral reef feel inadequate. But a hit is out, indeed, and some aliens try attacking Kara in order to cash in. Everyone decides that keeping Kara in hiding might be the best plan, since the high bounty means a huge number of aliens might be coming after her and Kara’s fully capable of defending herself, but probably not on the scale of “lots of people after ‘buy a planet’ levels of money.” Team Supergirl tries keeping Kara out of harm’s way by distracting her with Settlers of Catan, but it lasts about as long as you’d think and she's off. Aw, Settlers of Catan is a fun board game, though. Think about your grain supplies, Kara! One more brick and you could build a settlement! Kara, no — what about your sheep, Kara! Sorry. Board Game Night flashbacks. Anyway. One of the aliens after Kara is a mind control telepath who uses the phrase “Come at me, bro” unironically, so even if he hadn’t been trying to kill our favorite sunshine puppy, he’s an awful person and deserves DEO jail. I don’t make the rules, kids. Telepath tries getting Mon-El to do his dirty work for him via psychic puppeteering, which leads to a Kara/Mon-El fistfight that had the anti-shippers applauding and giggling. I was applauding and giggling as well, but that was because Mon-El actually told Kara to flee from his wicked, mind-control punches and Kara is freaking Supergirl. Dude, she can handle you. She can handle nearly anything. The “super” in her name is not there as an inside joke, it’s there because she could literally rip off your arm and beat you to death with it. But she wouldn’t do that because, as previously mentioned, she is a sunshine puppy. 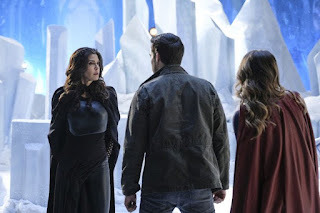 After the whole team learns Mon-El’s mother is responsible for the bounty, Mon-El suggests that he and Kara run away together and live a romantic life away from Earth, like space-travelling Romeo and Juliet. Uh... buddy, no. Not only because Romeo and Juliet is not happy, but also because (and I realize I’m starting to get repetitive, here) Kara is Supergirl. She does not run away from threats. Not even when those threats come in the form of Queen Rhea wielding kryptonite sai and threatening Kara’s life. Which, naturally, happens. And Kara is in so much danger from the kryptonite exposure that Mon-El actually agrees to go with them. AND he tries convincing his father to be a better ruler, give their people civil rights, stop dealing in slavery, etc. (Yaaaay!) but then the DEO storms the ship to rescue Mon-El and everything goes to crap. Also, Mon-El breaks a spaceship window in space and nearly dooms everyone to death within the sucking void between stars. He’s not the brightest. Or the nicest. Back on planet Earth, Mon-El and Kara enjoy not being separated by lightyears. J’onn is getting a talking-to from President Wonder Woman because he took action against the Daxamites even though she expressly forbade it. Up in the Daxam ship, Queen Rhea is committing regicide and ramping up to be a long-term villain. Her motivation? Kara represents Krypton’s habit of taking everything from Daxam, right down to Kara taking away Rhea’s son. Yeah, sure, lady — completely ignore the fact that you tried murdering your son’s girlfriend and stealing him away against his will to be a dictator-in-training. Your pain is totally Kara’s fault. I just want to talk about Alex and Maggie, not because their story had any amount of weight in the A-plot, but because a healthy, adult relationship on shows of Supergirl’s ilk is so rare that theirs deserves some spotlighting. I have no idea what ghostwriter they’ve pulled in to exclusively write the Alex/Maggie stuff, but I hope they give that person a raise because seriously, I cannot believe that the same writers who wrote Kara/James and write Kara/Mon-El also write Alex/Maggie. Here’s the summary for their story in this episode: Alex and Maggie are walking back from a yoga class and they run into Maggie’s long-term ex-girlfriend. Alex, because she’s very cool, is polite to Maggie’s ex and even gets her invited out to dinner so everyone can get to know each other. That’s a little weird, granted — most people don’t want to eat dinner with their ex and their current significant other, no matter how very cool the people involved are. It’s all for nothing, though, since the ex doesn’t show for dinner and it turns out that Maggie got really hurt in her last relationship... then it turns out that Maggie had actually cheated on her ex-girlfriend, and that’s why they broke up. And you know what happens in order to unravel this tangle of romantic lies and personal issues? Alex and Maggie talk to each other. Alex recognizes that a lot of Maggie’s issues come from a fear of getting hurt by the people closest to her and she promises that Maggie won’t have to worry about that with her, but she implores Maggie to be honest. Maggie discusses their past and their breakup with her ex, and they part on friendlier terms. It’d probably still be weird if she were to third-wheel on one of Maggie’s dates with Alex, but they seem to clear the air overall and both of them are better for it. Kudos to Supergirl for subverting just about every romantic drama trope it could: not making Alex a jealous girlfriend (and not using the “awkwardly cool because she’s trying to hide her jealousy” sub-trope), not having Maggie lie to Alex about her break-up throughout the whole episode, not having Alex nose-dive into an inferiority complex over the idea of Maggie possibly cheating on her, and even having Alex fix the relationship between Maggie and her ex rather than reveling in its failure. Guess what the secret ingredient to all this fantastic, amazing relationship non-drama was? Communication! It’s a beautiful thing, you know. Take note, every other television show ever (but particularly the ones involving lying superheroes). I think the title of this episode is a pun. Distant Sun. Distant Son. Get it. Kara going “Hey, that’s me!” at her little hologram-self was the actual cutest thing. James’s non-role on the show this season would be comical if I didn’t like him as much as I do. I don’t really understand how the Daxam King and Queen have any power, money, or political sway. Their planet/society is, at worst, smoking rubble or, at best, a post-apocalyptic wasteland. The President of the United States is possibly an evil alien. On the show, I mean. Yeah... totally just the show where that’s true.